Tag line: "Spend Thanksgiving with Good Ol' Charlie Brown"
Charlie Brown (voiced by Todd Barbee) finds himself between a rock and a hard place when Peppermint Patty (Christopher DeFaria) invites herself, as well as her friends Marcie (Jimmy Ahrens) and Franklin (Robin Reed), over for Thanksgiving dinner. Aside from the fact that he has no idea how to prepare a proper turkey dinner, Charlie Brown and his family, including sister Sally (Hilary Momberger), are already committed to going to his grandmother’s house for the big meal. Not wanting to disappoint his friend, Charlie Brown turns to Linus (Stephen Shea) and his dog Snoopy for help, and together they concoct a very unusual Thanksgiving feast consisting of jelly beans, popcorn, and toast. But will this satisfy the finicky Peppermint Patty? 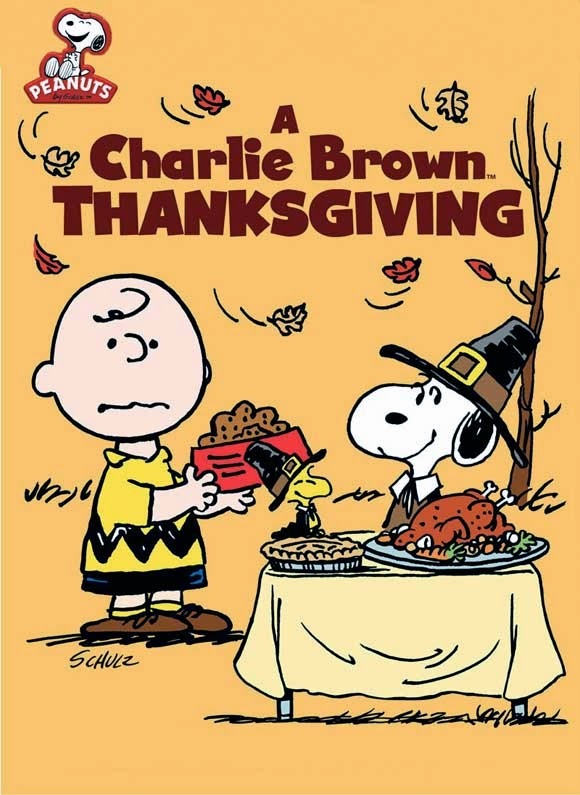 I was only 4 years old when A Charlie Brown Thanksgiving was first broadcast in 1973, yet I do remember watching it's premiere, so the movie holds some sentimental value for me. What’s more, this special has its share of memorable moments, like Linus’ retelling of the first Thanksgiving Feast, and Snoopy enjoying a meal with his little bird pal, Woodstock (the Vince Guaraldi tune “Little Birdie”, which accompanies Woodstock’s appearance, has also stayed with me over the years). That said, I was never a big fan of Peppermint Patty, and A Charlie Brown Thanksgiving was a big reason why. Aside from being such a pushy character, I couldn’t understand her negative reaction to the meal Charlie Brown and his pals prepared. When we were kids, my brother and I loved the idea of having popcorn and candy for Thanksgiving dinner, and the fact that she didn’t feel the same way always stuck in our craw. Still, I enjoy A Charlie Brown Thanksgiving, and while it’s certainly not the best of the Charles Shultz’s Peanuts specials, it was as much a holiday tradition in my house as A Charlie Brown Christmas and It’s the Great Pumpkin, Charlie Brown.